This one gets 5 unapologetic owls/stars from me! Last year seemed to be the year of fantasies. So many books, so many authors, so many stories -- everywhere you looked there was no shortage of them in the market. I thought "teen romance" had sort of been abandoned and felt a bit lonely, which is what I continued to read, along with a bunch of other YA contemporaries and adult books, which don't tend to feature fantasy. All this to say that I realize some people have become completely saturated with the genre. In fact, as soon as I finished this book, I jumped on Goodreads to post my rating. This is also the time that I take to read other people's reviews of the book (since I don't do that AT ALL prior to picking up a book because I know it will influence my experience in some way). What I noticed is that a lot of people who gave it a lower rating thought that the story, as a fantasy, was good and the writing was great, but that it just contained all of the same elements of the trope that others included. Personally, I think I still would have loved this one! One reason for that was that Elly Blake's characters just jumped off the page for me. The book offers a great sense of pacing and is action packed from the very first page, hell, right from the very first line of "I offered my hand to the fire." Her writing is so fantastic and flows so well that honestly, if I didn't have a couple of life things in the way, I would have finished this one in one sitting. Ruby is a strong main character, with much to be somber over, but she uses that as ammunition during times she needs to defend herself. And let's not talk about how Arcus is one of my new book boyfriends. It is true...the name "Arcus" took some getting used to but I eventually got over this as he was a warm-hearted protector (despite his frosty nature) and possessed qualities worthy of a love interest. 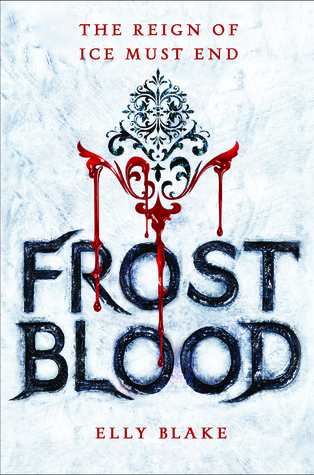 The frost kingdom is in dire straits as the Frostbloods and Firebloods have a tumultuous history which has brought about a lot of bloodshed throughout the years. And like any great story (*cough* Star Wars *cough*), rebels have formed to train and prepare to fight the evil ruler of the kingdom. Ruby, along with Arcus and her newly-discovered allies, prepares for the biggest fight of her life in an effort to save not only herself but to save the land. What an amazing and adventurous story and I just wished I had all three books in order to complete the entire story arc at once! And I'm nervous about what's to come in Fireblood (Frostblood Saga #2) and I hope that some of the theories I have prove wrong. But the wonderful thing is that the second book comes out this year in September so I don't have to wait too long! I hope you give this one a chance, even if you are of the camp fed up with fantasies. This one will surely bring you out of that slump. I just bought this one recently but haven't gotten to read it yet. Everyone seems crazy about it tho! I've only seen a couple reviews from people who didn't love it. Great review!